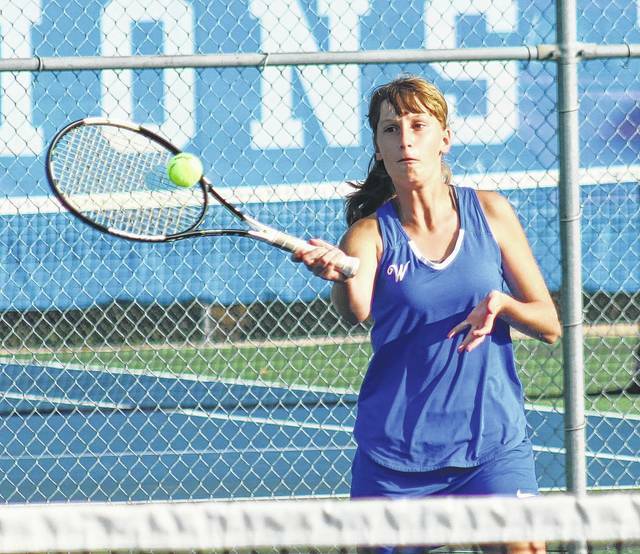 The Washington Lady Blue Lion tennis team hosted the team from Hillsboro High School for a Frontier Athletic Conference match at Gardner Park Thursday, Aug. 24. At first singles, Washington’s Megan Downing defeated Jessica Moon, 6-0, 6-1. At second singles, Hillsboro’s Breanna Fender beat Jen Richards, 6-3, 6-4. Sydnie Hall of Washington defeated Abby Harmon, 6-2, 6-3. At first doubles, Bethany Wilt and Brooklyn Foose went three sets for a win over Morgan Kemper and Samata Stodgel, 6-1, 3-6, 6-4. At second doubles, Brynne Frederick and Payton Madux beat Julia Hart and Lyric Richman, 6-1, 6-1. Washington is competing in a tournament Saturday at Marietta College. The Lady Lions will have three home matches next week: Monday against Circleville, Tuesday hosting Miami Trace and Thursday hosting Jamestown Greeneview. Matches start at 4:30 p.m.
Brooklyn Foose returns a volley for Washington during a first doubles match against Hillsboro Thursday, Aug. 24, 2017 at Gardner Park. Foose teamed with Bethany Wilt to win the match in three sets. https://www.recordherald.com/wp-content/uploads/sites/27/2017/08/web1_Brooklyn-Foose-WHS-10us-8-24-2017.jpgBrooklyn Foose returns a volley for Washington during a first doubles match against Hillsboro Thursday, Aug. 24, 2017 at Gardner Park. Foose teamed with Bethany Wilt to win the match in three sets.